The total area of non-durable eucalypts is around 23,000 hectares. Growing eucalypts for timber NZFFA 2015. A series of videos and information notes covering all the main practical aspects of growing eucalypts. The eucalypts section of the NZ Wood website – information on timber and utilisation. Part 18. Ash eucalypts Contact the Scion library for this publication. Under the SWP programme there is considerable interest in fast-growing eucalypts for solid wood production, and this requires a number of new traits to be targeted in our breeding programmes. Current research is focusing on developing breeding populations of E. fastigata and E. regnans towards improved solid wood properties. Another important part of increasing confidence in eucalypt forests is to integrate good pest tolerance into the breeding programmes. 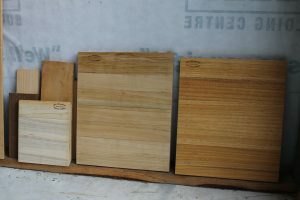 Improved selection methods and recommendations of best genotypes for solid wood production. Turnover of breeding populations to the next generation. In partnership with Juken New Zealand Ltd, SWP will carry out commercial scale LVL trials incorporating eucalypts with the aim of increasing the strength and stiffness properties above those of radiata pine-only LVL. See the SWP Programme Description pages 13-15 for more information on current SWP research on E.fastigata and E. regnans. 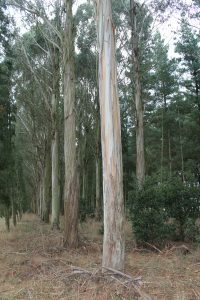 Eucalyptus nitens occupies the largest area of any eucalypt species in New Zealand, thanks to its suitability for high-quality pulp. SWP research is focusing on the potential to improve the solid wood properties of E. nitens, enhancing its potential value for growers. Work includes both breeding programmes and wood processing research. One project has successfully shown that E. nitens can produce an oriented engineered lumber – OEL™ – which takes 1 metre- long logs and produces structural products with known, uniform and reliable properties. This will potentially add value to short, poor form logs which would otherwise go for pulp or firewood. 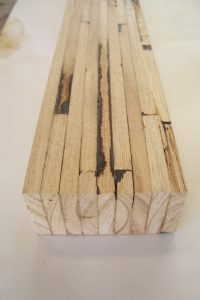 novel drying techniques to overcome the problems of splitting and warping that are a characteristic of E.nitens. See the SWP Programme Description pages 15-18 for more information on current SWP research on E. nitens. OEL (TM) made from E. nitens.